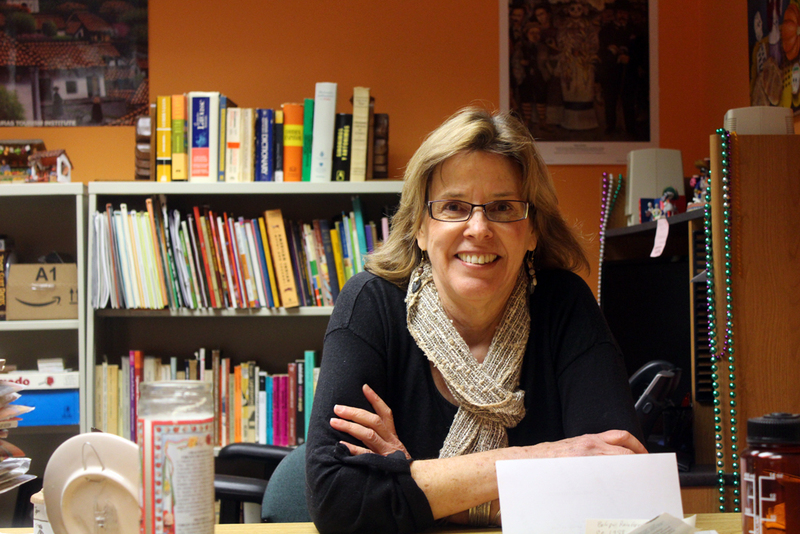 Professor of Spanish Julia Villaseñor has taught at Malone for 25 years. Her favorite part of her job is being in the classroom and being able to form relationships with her students. Villaseñor: My first career was working in refugee resettlement. Then I moved overseas and when I came back, I was in career limbo. Somebody I worked with in refugee resettlement, who lived a couple blocks away from Malone, called me one day and said, “Are you still looking for a job? Malone has posted an ad for a Spanish professor.” I had never heard of Malone College, but I thought, “Well, why not?” I applied, got the job, and I’ve been here ever since. Villaseñor: I grew up in Ohio, believe it or not. I was born in Akron City Hospital. We moved to Dayton when I was a child and spent several years living there, and then moved back here. And after that, my life changed a lot. Aviso: Do you have any pets? Villaseñor: Yes I do. I’m not going to tell you how many cats I have. There are certain things about a woman that have to remain mysterious. In my case, it’s the number of cats. I have cats and dogs. I’ve had bunnies and guinea pigs. I grew up always loving animals and I was in 4-H as a child. Everyone has told me my entire life that I should have been a vet, not a Spanish professor, because I tend to be good at detecting medical issues, treating, and all that kind of stuff. But alas, I’m an academic instead of a veterinarian. Aviso: Would you say your pets are a hobby of yours? Villaseñor: They are kind of like a hobby. We’ve done a lot of training with the dogs, a lot of rally and agility work with the dogs, therapy (we have two dogs that have been certified for therapy), and if I had more time in my life, I would do more with that. I do a lot of pet rescue, much to my children’s dismay. And no, I don’t keep them all. Aviso: What languages do you know? Villaseñor: You would have to qualify by level of knowing. Obviously, Spanish is my strong suit. The romance languages overall I can navigate pretty well when I’m in those contexts. I had eight years of French before I started learning Spanish, so with a little brush up, French would be really good. I can navigate Italy pretty well. They make fun of me and say I speak Italian with a really lovely Spanish accent, but that doesn’t matter to me because they understand me. I can be with my Romanian friends and understand them perfectly well, not that I really speak Romanian. I know some German, but that’s really rusty at this stage of my life. And I have been able to pick up a fair amount of Kiswahili from living in Africa. But those are rudimentary compared to Spanish. Aviso: What countries have you been to? Villaseñor: Well, of course I lived in Mexico. That’s where I went to school. So, Mexico, Guatemala, Honduras, Costa Rica, Ecuador, Peru, Argentina, England, France, Germany, Italy, Turkey, Greece, Egypt, Kenya, South Africa, Ireland, India, Canada, Spain, and Belize. I think that’s about it. Aviso: Which is your favorite country? Villaseñor: For me, Mexico and Kenya are like going home. I love being in both of those places the most. Aviso: What is the best food you’ve discovered on your travels? Villaseñor: I don’t think I can answer that. I love to eat. I love lots of different kinds of food. That said, I’m not a big meat eater, but I don’t shy away from spice, so I love Indian food. I love good Mexican food. I get tired of restaurants that are called Mexican in Ohio. I’d rather make my own food. I’ve had a lot of different weird meat. I’ve had crocodile, I’ve eaten giraffe, antelope, eland, iguana, and zebra. [But] do I need to eat them again? No. Aviso: What is an interesting fact about yourself? Villaseñor: Some people find it interesting that I did my entire undergrad outside of the U.S. I’ve ridden a camel across parts of the Sahara. I graduated from high school when I was 17; I only did two years of high school. I went to Mexico when I was 17 to live, which was considered kind of outrageous in my day. I have held sharks and manta rays in the water. Archeology is kind of my second career instead of veterinary medicine.